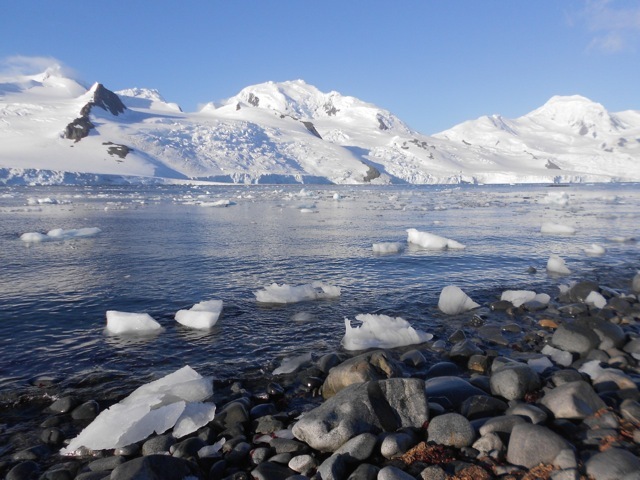 Antarctic Voyage – The Journey Back to Civilisation. Find Days 1 – 3 here: We’re Going South Baby, WAY South! Last night the swell rocked the boat so madly many people were unable to sleep. While the seas weren’t often bad and many of us no longer show signs of sea sickness, some can barely get out of bed to attend meals. On the morning of Day 8 we anchored off Verdnasky Island and were invited by the Ukrainian science team there to visit Verdnasky station. 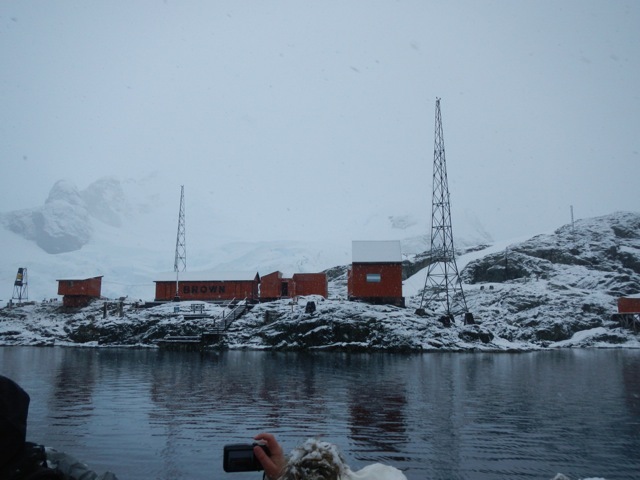 We broke into three groups: a third visited the station first, another third visited the abandoned Wordie station on the other side of the same island, and the remaining third were the kayakers and divers. Each group eventually got a turn to visit the main research station. Wordie Station was the original research station and must have been built for short, thin people as it’s pretty cramped. When researchers moved to the newly built Vernadsky station, Wordie station was converted into a museum. 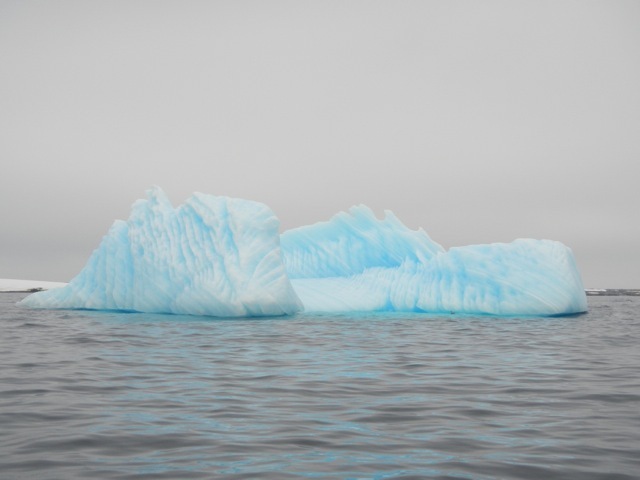 To get between the two stations we had to cruise through sets of pure blue icebergs with amazing natural textures on them. Verdnasky Station is huge in comparison to Wordie with a pair of long sprawling corridors leading to many different science labs. Outside there are other rooms and silos for storage, additional labs and fuel. Upstairs there’s a relaxation room which holds the southernmost gift shop and the southernmost Post Office in the world, where we got our passports stamped and sent postcards (most took more than a year to arrive). Through an archway was the world’s southernmost bar where we could buy large shots of vodka for US$3. After exiting the station and waiting for the Zodiacs to collect us, we gathered on the pier to watch a leopard seal torment a penguin. When it noticed it had an audience, it made a display of tearing its lunch to pieces before consuming it. While macabre, it’s part of nature and we couldn’t take our eyes from it. Back on the ship we headed further north to Petermann Island for another short hike. 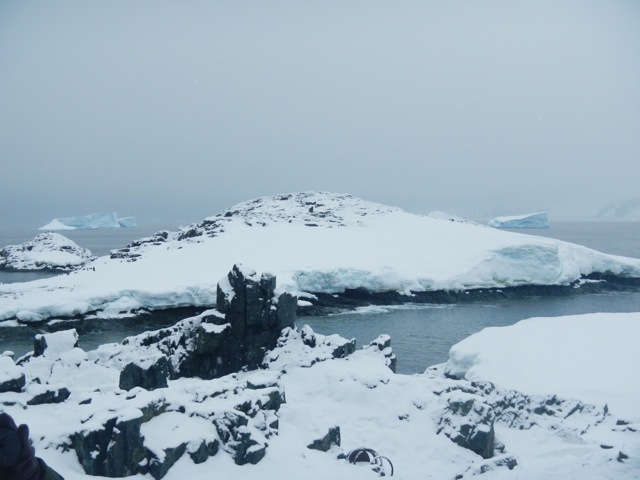 The island itself has different colours of snow – green from algae and pink from penguin poo. The hike was a walk up a slippery mound to a cairn and down the other side. This island had some beautiful views, but was the smelliest island I’ve ever been to. While the old saying: ‘Don’t eat the yellow snow’ still stands, a new one came from this trip: Definitely don’t eat the pink snow. 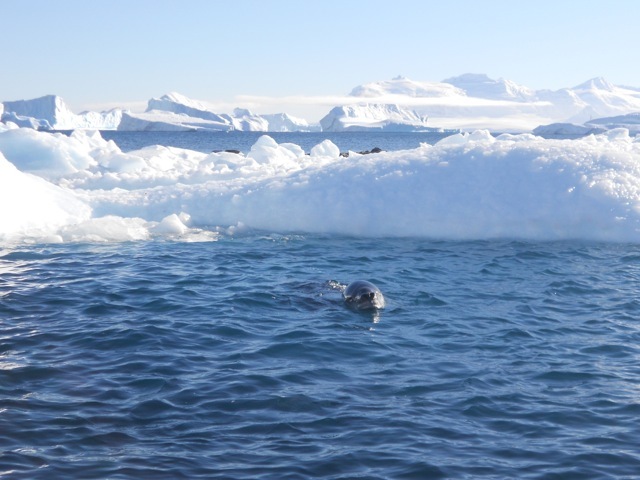 As we made our way back to the ship we spied another leopard seal enjoying a penguin. Penguins are considered the rabbits of the south, they breed like crazy and provide good food sources for the seals and larger sea birds. Across the bay, we could see the base of several majestic looking spires their tops hidden behind the cover of clouds. Thankfully the clouds began moving as we were leaving, giving us a partially better view. The plan for the day was to make landfall in the morning and begin the journey back across the Drake Passage in the afternoon. This was not to be, however, as the wind and seas were too harsh. 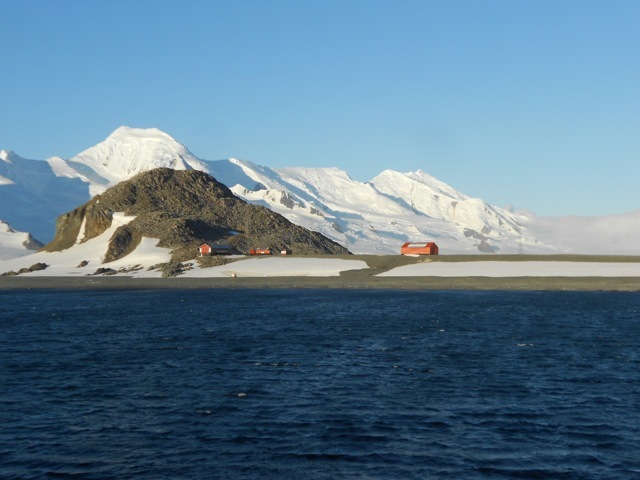 Instead we sailed back to the South Shetland Islands to attempt Deception Island again. When we arrived the wind was still strong, but thankfully in the right direction allowing us to enter the volcano via a stretch of water known as Neptune’s Bellows. We sailed through and even with the low clouds it was picturesque. The bay inside was huge and we anchored in a smaller bay just inside called Whalers Bay. On reaching land, we set foot on black volcanic pebbles and sand. There were a number of old broken down buildings which we were warned not to enter because they were unstable. …which provided great views both inside and out. …to a higher perch. With the clouds and the blue-green of the sea, the sight looked like a mystical world that photos just don’t do justice to. 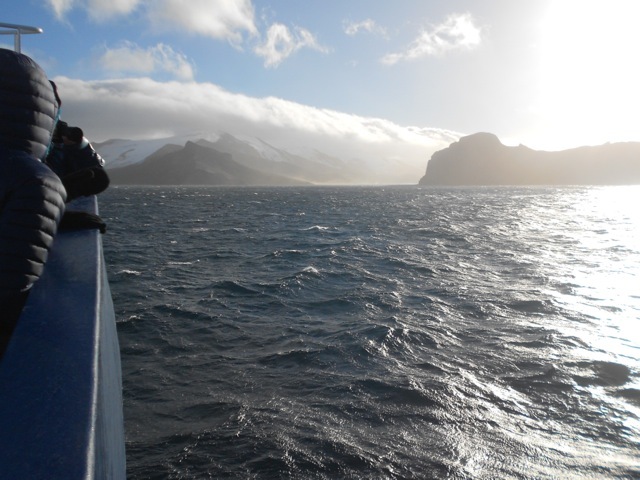 Back on board, we set sail for the Drake passage and as expected the seas were a little rough. For two days we sailed across the open and slightly choppy seas. It wasn’t as crazy as we’d expected, but after making landfall twice each day in the Antarctic, hanging about the ship sent many of us a little stir crazy. There were lectures to bide the time but I dove into a book and managed to finish the second of two novels I’d begun on the journey. 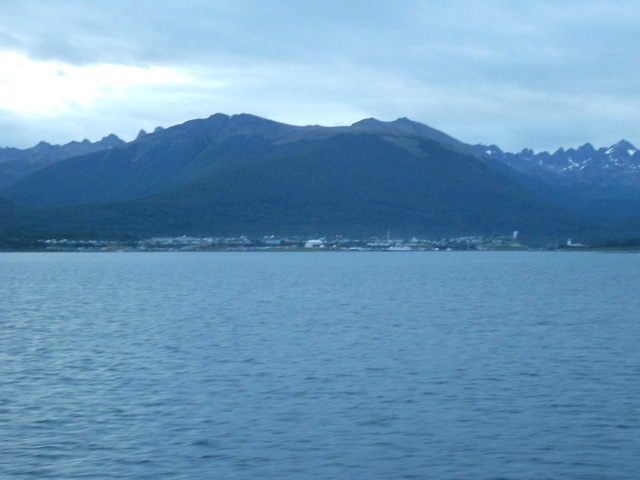 We arrived into the shelter of the Beagle Channel in the late afternoon of Day 11 and docked in the early morning at Ushuaia. We disembarked after breakfast. 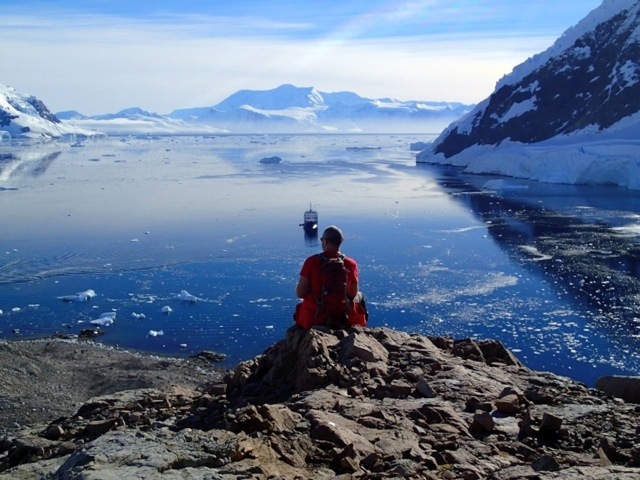 My Antarctic trip will always be one of the most memorable experiences of my life and worth far more than I paid for it. The many places where we made landfall and the multitude of wildlife were unreal. People on board were friendly, although with 37 different nationalities it was sometimes difficult to communicate well. There were many new experiences and I’m glad I chose the Plansius from Oceanwide Expeditions, as I’ve heard some of the other cruises were not as well organised or the crews were not as interested in giving passengers the best experience. Next, after a couple of days in Ushuaia, I began my long journey north along the Andes starting with Patagonia. Overnight the weather had changed and on awakening we found it had begun to snow. While we’d loved the clear days, it just hadn’t felt like Antarctic until now. As we moved through the water we could see the snow slowing beginning to freeze the water. We were told the process starts with a type of ice called ‘grease ice’, which gives the ocean a strange greasy look, then moves on through several more stages before the bay freezes over. It would have taken hours, so no chance of us being iced in. After 45 minutes of cruising through the icebergs we were dropped off at the jetty. 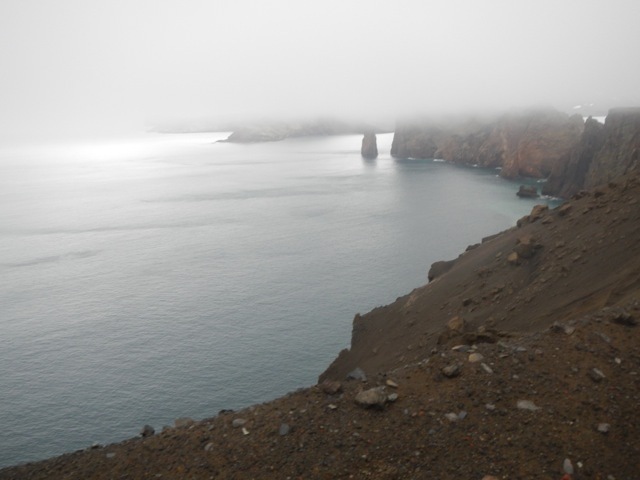 …and up the hill behind it where a pinnacle of rock provided a great, albeit foggy view. There’s only one real way down from the pinnacle: on your backside skidding down a previously rendered track. I shot down the first part but there was an older guy in front of me who was struggling to get going. I couldn’t stop in time and careened off the side of him to slide sideways down the rest of the hill. Awesome! If there had been more time, many of us would have climbed up and gone again. Then we were back on the ship and heading out along the beautiful Lemaire channel, with great icy mountains and glaciers along both sides. Whales have now become a common sight and penguins are just everywhere. Icebergs larger than previously seen dot the waters, the very occasional one having a leopard seal napping on it. 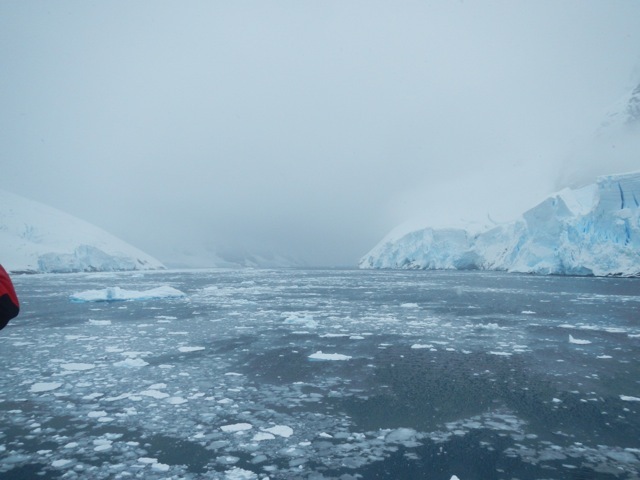 We came out into a bay known as The Iceberg Graveyard, full of huge icebergs some twice the size of the ship or larger. Our next stop was Booth Island. 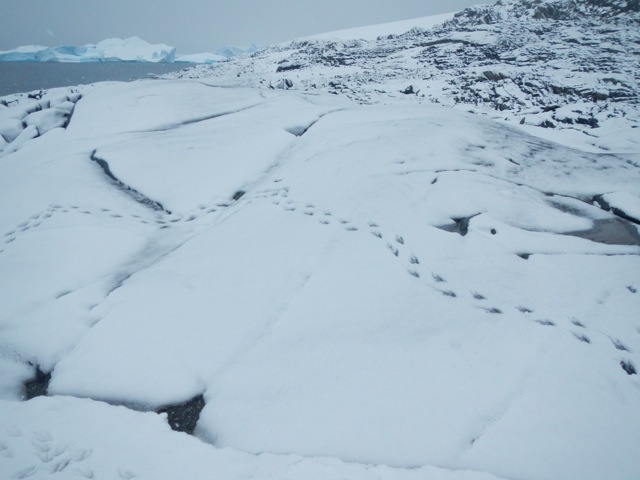 We land and see our fourth variety of penguin, the Adelie along with their tracks in the fresh snow. We then climbed a hill to get awesome views in all directions, but because of the low clouds only the base of several rocky spires could be seen. We couldn’t resist sliding down the hill before being whisked back to the ship. 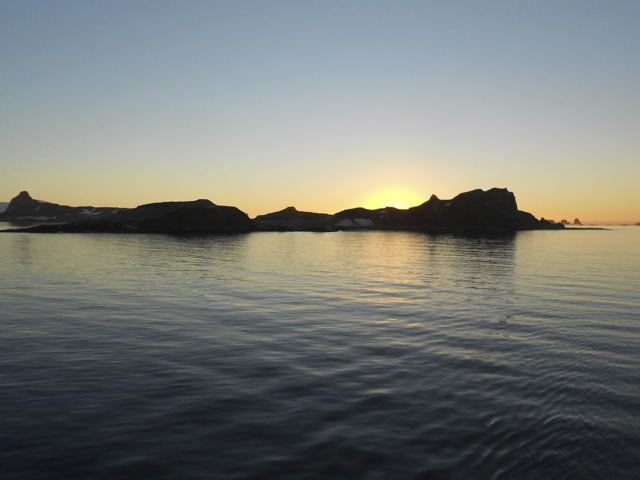 That evening the boat made its way down the peninsula in hope of crossing the polar circle. According to the captain, it depended on the weather and sea conditions if we were to cross. We all went to bed hoping the conditions would be right. The polar circles are defined by the sun. 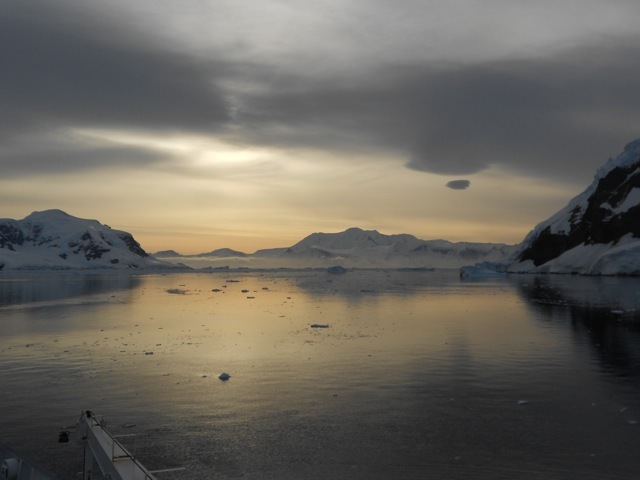 In winter, Antarctica is a sunless icy land, while in summer there is 24-hour sunshine. Today the battery of my fairly new camera refused to charge, evidently affected by the atmospheric cold. Thankfully one of my shipmates had a spare he could lend me. So, while I wasn’t using my own camera, all of the shots are my own. It was snowing when we were roused for breakfast and the seas were rather rough. At breakfast we watched the largest iceberg we’ve seen float past. It was massive, the part we could see above water was the size of a city block and perhaps 100m tall. Under the water, we’re told it’s 7 times larger. Then just after breakfast, we gathered in the observation lounge and with a glass of champagne to celebrate the crossing of the polar circle. We had only a single landfall below the circle. Two hours later we entered a bay where the water was significantly calmer. 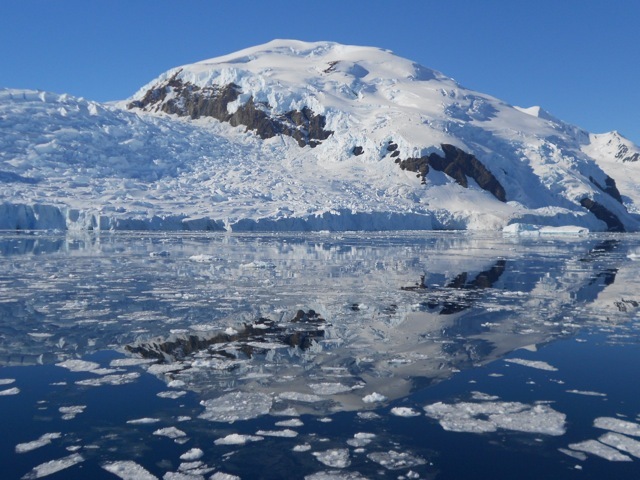 After another 30 minutes we boarded the Zodiacs and make our way around icebergs to land at Detaille Island, site of a former English research base. 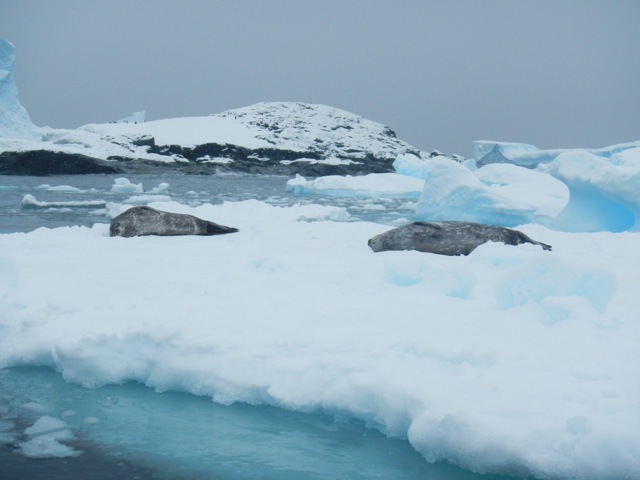 The snow was thick on the ground and there were two different kinds of seals just languishing on icebergs – the Crabeater Seal and the Weddell Seal. They peer up as we go by but we don’t interest them so they go back to their napping. 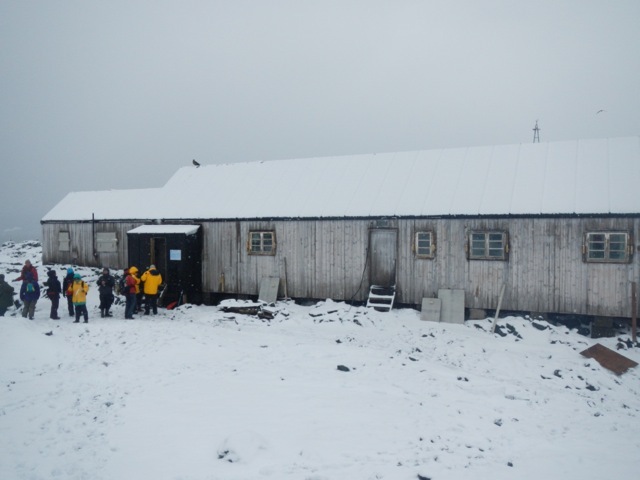 On the island is the hut where the researchers lived and we were able to go inside. It’s fairly roomy and once housed 8 scientists comfortably. 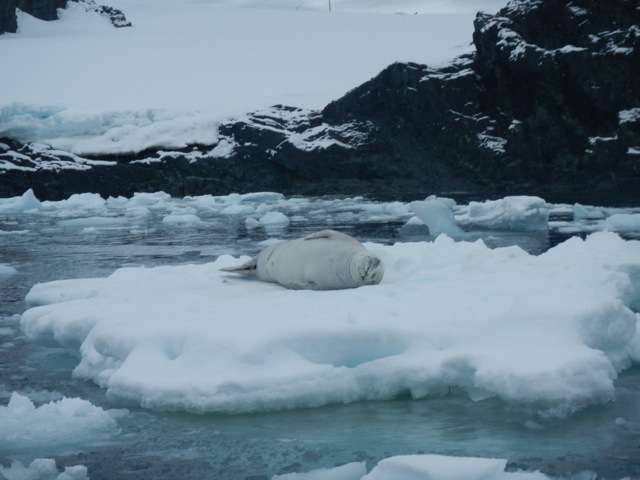 After our time on the island we were taken on a cruise through the icebergs to get a little closer to the napping seals. Then back onboard the Plansius we set off again, beginning the long journey back along the peninsula. Mid afternoon, after we cross the polar circle again, we came across a large pod of Orca hunting. We circled them for about an hour, trying to determine what they were doing. The pod was about 10 animals strong and had a huge male with them. We were told they were killing an Arnoux Beaked Whale by trying to drown it They did this by lying on top of it to prevent it getting to the surface. Once they considered it dead, they began tearing into it. It’s nasty, but it’s nature. This kind of action takes documentary makers 10 years to find, and we were lucky to chance upon it. Pictures don’t give it justice, however. Next, The Journey Back To Civilisation. The weather continued to be great, but it wasn’t the weather that was to darken the day… more on that later. The beauty of the white islands was immense and even more so because of the blue skies. Overnight the ship was moved further along the South Shetlands to Half Moon Island. We made landfall early and hiked along the beach with plentiful Chinstrap Penguins hanging out on the rock formations. Nestled among one group we found a solitary Macaroni Penguin. While not as plentiful as the penguins, there were many fur seals in groups along the rocky beach. They too were interested in us, but were more dangerous, so we took care not to get too close as they have a tendency charge. They’re easily warded off if they do by presenting a strong hand and calling ‘stop’, or by simply clapping hands. Not long after going ashore, we started hearing reports over our expedition leader’s walkie-talkie about a diver that had gone missing. For the rest of the morning our leaders began to act a little strange, anxious. Our stay on Half Moon Island was extended an hour longer than planned. Then after being ferried back to the boat, we were called to an urgent debriefing. The diver that had gone missing was an experienced Japanese woman. They’d found her drifting in 5 metres of water and had attempted resuscitation, but after 90 minutes she had been pronounced dead. No other news was forthcoming. This set a somber tone across the boat and we weren’t sure if the trip was to continue. We eventually did get word we were and got back underway, but some of the crew were called to deal with certain things such as contacting next of kin, authorities, embassies and the storage of the body. But the weather wasn’t playing nice and with 35 knot winds, the captain decided it would be too dangerous. Instead we set sail for our next destination, the Antarctic Mainland and The Great White Peninsula. On the way we spotting what was to become a very common sight… Humpback Whales. Crossing the channel was an experience. Because of the winds the swell went a little crazy and that evening only a little of half of us passengers made it to dinner. It wasn’t long before I too retired to my cabin a little worse for wear. We were lucky, today was the fifth beautiful day in a row, clear and sunny. That’s five more than some expeditions. I awoke at 4am after going to bed at 8.30pm the night before and felt great. 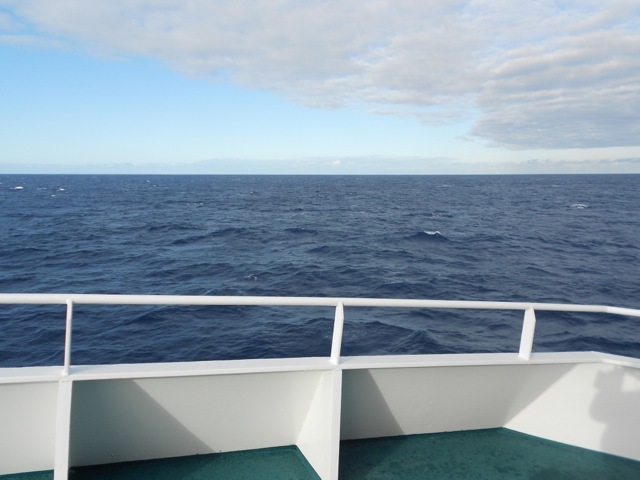 I peered from the cabin window and saw clear seas and the long white peninsula. 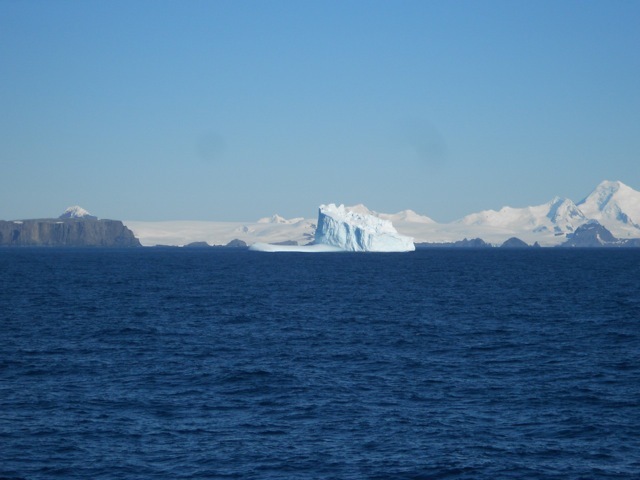 We anchored at Cuverville Island surrounded by white cliff lines in a bay dotted with icebergs. It’s hard to describe the beauty of this place. 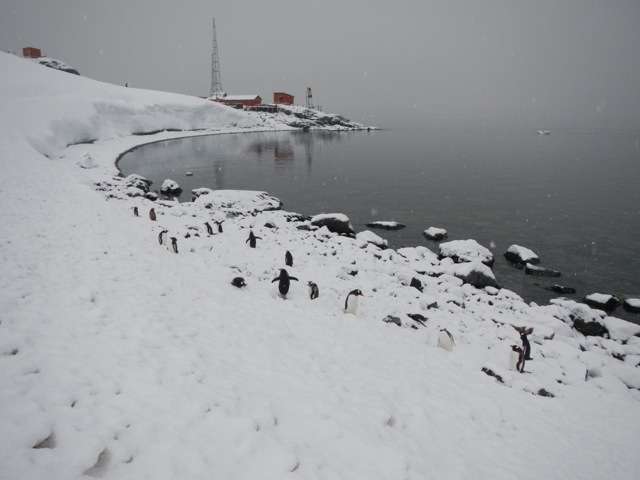 We landed and wandered around the Gentoo Penguin colonies for some time. I even had the wonderful experience of a leopard seal coming up to the craft to check us out before it went back to playing with the penguin that would eventually become its next meal. …and in some places it was so calm the icy water mirrored the snow-covered mountains and massive frozen glaciers. 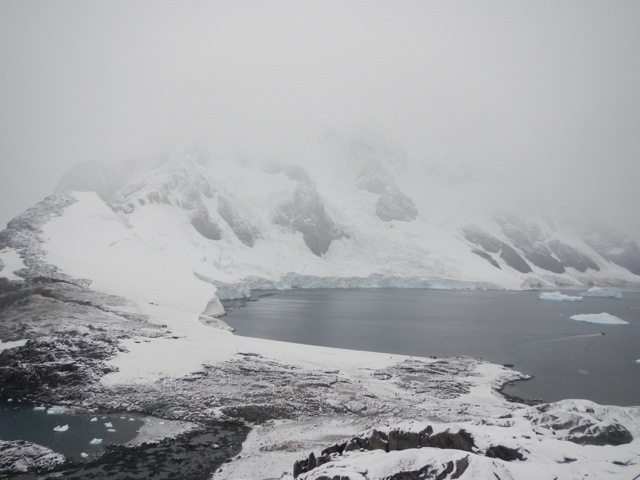 We made landfall, and set foot on the main landmass of Antarctica at Neko Harbour. Woo-ha! And guess what? There were Penguins! Surprise! We hiked up the side of a mountain to a great viewing spot. I was first to sit on a rocky outcrop looking out across the magnificent bay. Then some of us took a ‘polar plunge’, going for a swim among the icebergs. Since salt water freezes at just below zero degree celsius, it was cold but not as cold as expected. If anything, it was colder getting out. 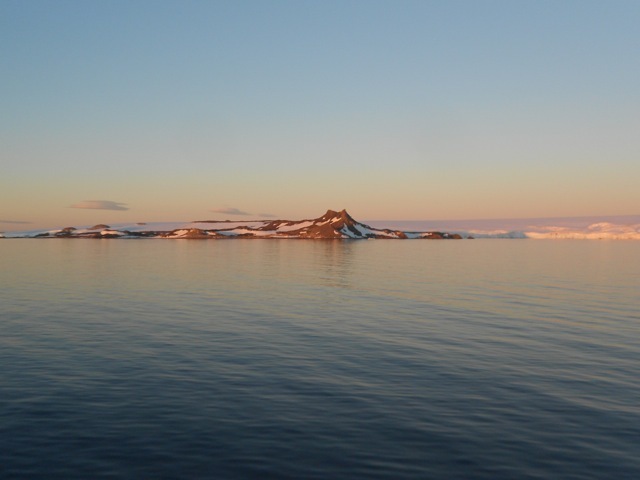 Then in the beautiful clear evening what else do you do in Antarctica? We had a BBQ on deck, of course! It was a little chilly but great! We put down anchor in Leith Cove and watched the sunset. Next we’re heading further along the peninsula our Next Stop, The Polar Circle. Punta Arenas, Chile – Impressions. Punta Arenas (loosely translated as Sands Point) is the largest city in Southern Patagonia and is described as a spiralling metropolis, although it didn’t actually seem that large when approaching it. My bus ride from Ushuaia took 12 hours including a stop at Rio Grande for Argentinian customs. We stopped again at the Chilean customs before crossing the Magallenes Strait from Isla Grande to the South American mainland by ferry. My primary reason for coming to Punta Arenas was as a stop off on the way to Puerto Natales, as there was not direct bus route. While I was only there for two days and only got to see a small amount of the city, it felt like a typical western city except everyone spoke in spanish. Thankfully english speakers are more common in Chile than in Argentina. My hostel – Hospedaje Costanera – was near the city centre and once I’d settled in, I walked the eight blocks back into the centre. The city wasn’t a mad rush like Buenos Aires and was easy to get around. The collectivo system in Punta Arenas – and Chile in general – is something different. While there are traditional taxis and the occasional bus, collectivos are level between. Occasionally they are mini-vans, but usually just normal cars that travel a set route, back and forth. All you do is stand on its route, wave it down and if there’s room they’ll stop. Then, jump in with whoever is already in the car, pay 450 Chilean pesos (about 90 AU cents) and off you go. When close to where you want to go, yell and they’ll stop. It’s knowing where the routes go is the difficult thing. The city is also in the tax-free zone of Patagonia and has a vast tax-free shopping centre – Zona Franca. I went to check it out and it was the size of a large mall. It contained many electronics stores, all with cheaper prices that Ushuaia, but still more expensive than Australia. It was interesting to walk around but I didn’t buy anything, although I was tempted by some SLR cameras. 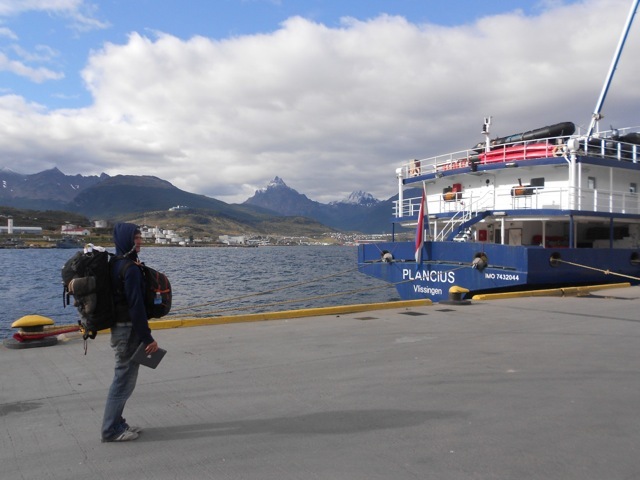 On the morning of my departure I simply went to the bus station, booked a bus and within a couple of hours was on my way to north Puerto Natales. 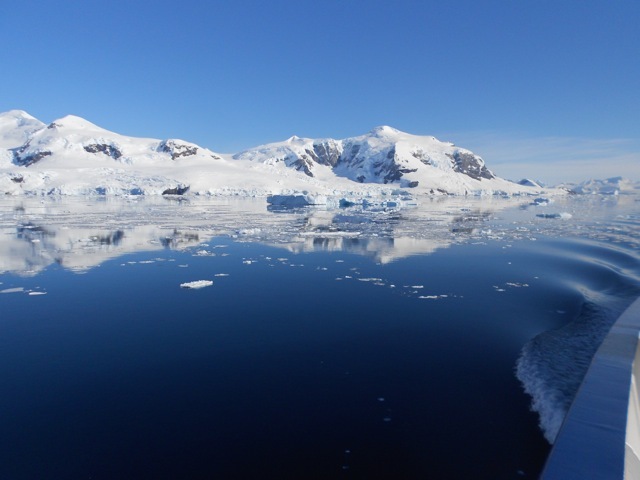 Antarctic Voyage – We’re Going South Baby, WAY South! In the mid afternoon of Day 1 we boarded the Plancius, a converted Dutch naval boat that’s been taking expeditions to both the Antarctic and Arctic regions for the past 9 years. 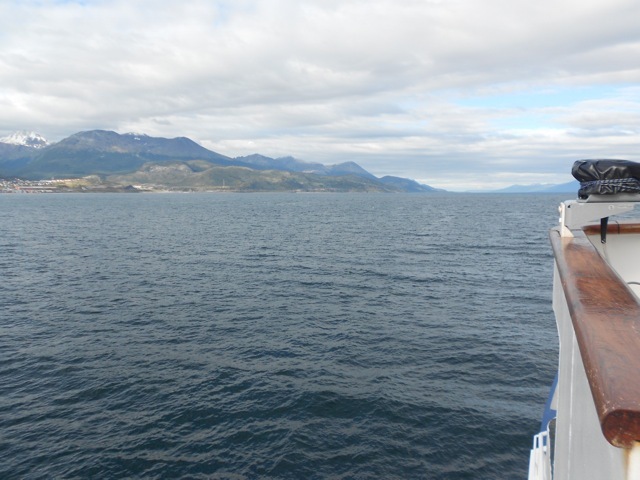 Once settled in out rooms, we set sail along the Beagle Channel with the glorious Patagonian mountain ranges along either side. Before dinner we were called to the main common area where we took part in the mandatory safety lecture and trial evacuation. Dinner was then served in the dining hall with a preset menu, which was brought to the tables by the wait staff. All onboard meals were three courses, including breakfast, but with the lack of gym facilities, we figured we’re all going to be putting on weight by the end of the voyage. The seas were calm and outside it was cold. Thankfully the agency I’d booked through had supplied warm clothing for the trip. As we ate our first whale was spotted, a sperm whale. Then as dinner finished we passed the last signs of civilisation, Puerto Williams, Chile. The boat wasn’t large but then it wasn’t small either. There’s the main common room/ forward observing deck/bar, where many lectures were held, and then two floors down and towards the rear is the dining hall. There are plenty of outdoor areas, but did I mention it’s rather cold out? This meant when there was a lecture, the only place to comfortably hang out was in your cabin. Mine was a twin share room. But for the most part we all went to the lectures. Sleep was difficult during the first night not because of the constant listing of the boat, of which there was little, but that the blankets on the beds were overly hot. But without then it became too cold. It took some adjusting. 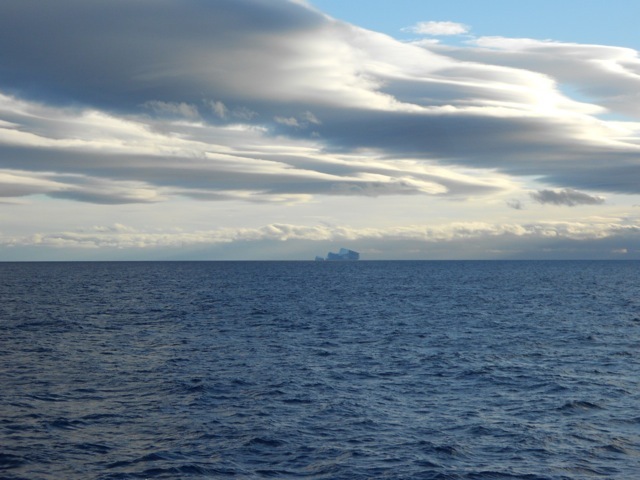 We were warned that the thousand kilometre, 2-day journey across the Drake Passage was often subject to high winds and rough seas, but on Day 2 we are blessed with a beautiful clear day and calm seas. Most of us were using sea sickness patches or tablets just in case. That morning we attended two lectures, one identifying the seabirds of the south we’d likely encounter and the other about why the weather is like it is in the Antarctic. The lectures were interesting and gave us something to do other than sit watching the expansive ocean go by. After a three course lunch, including two massive trays of cheese, we relaxed in the common room playing card games and socializing until the afternoon lecture. 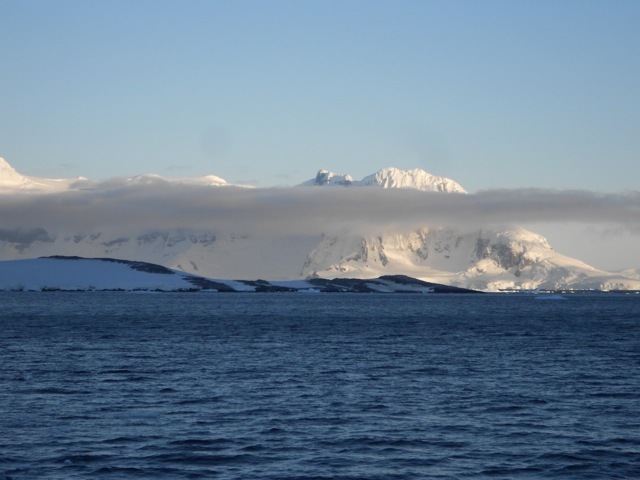 The expedition leader announced that due to the good weather we’d be arriving in Antarctic waters 12 hours early, and would be going ashore on the South Shetland Islands the following afternoon. While the Islands are considered part of Antarctica, they’re still a distance from the Antarctic Peninsula. 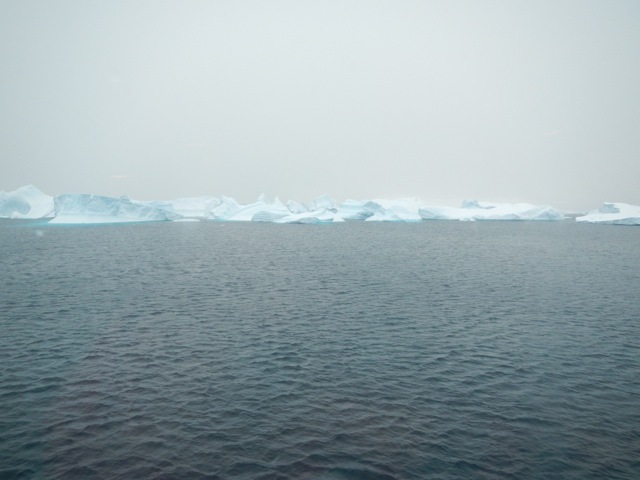 During our wakeup call on the 3rd morning, we were alerted to a large iceberg floating past the port side of the ship. While it wasn’t close, it was the first evidence of the great white land to come. It had been cloudy overnight, but would turn out to be another fabulous day in the Drake Passage, we even spied whales swimming beside us. As was suggested, because of the good weather we were on target to arrive at the Shetland Islands 12 hours early. 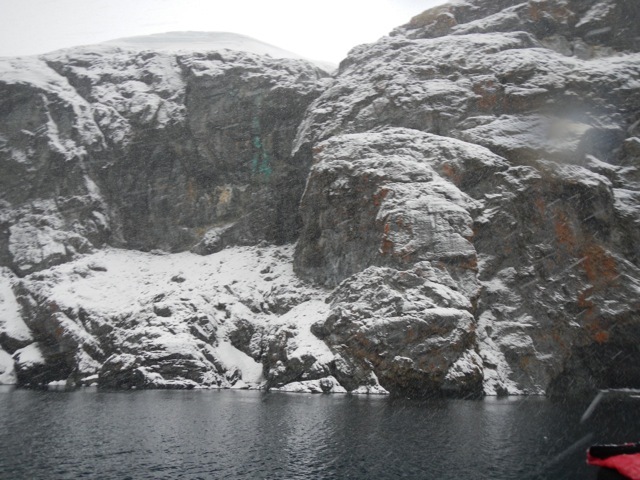 By late morning we began to see the icy cliffs of an Antarctic Island ahead of us. As the hours passed, the white landmass grew along with the number of icebergs. 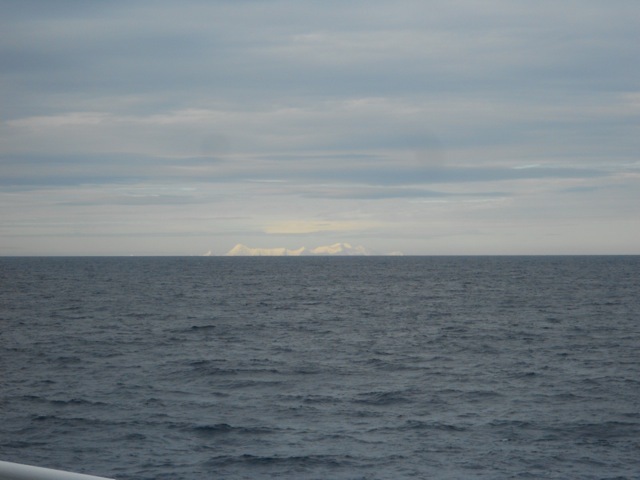 We began to see rocky islands, dispelling the idea that Antarctica is just a land of ice. We started to see signs of wildlife including the Giant Petrels with their 2 metre wingspan, and other birds mentioned in the lectures. 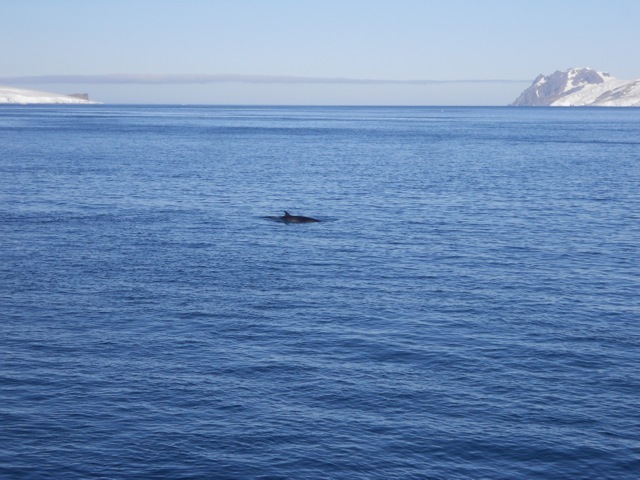 There were occasional sightings of fur seals and more whales. But it was the penguins that stole our attentions. While we’ve all seen them on land, they swim like nothing we’d seen before, skipping gracefully out of the water for breath every few moments before darting off again at amazing speeds once back in the water. We passed many small rocky islands and icebergs before nearing our first landfall site, Barrientos Island. After a briefing, we dressed in out cold weather clothing and got into the Zodiacs that would deliver us to island. …and the red beaked Gentoo penguins. While on the island, we saw many different penguin behaviours and learnt a lot about them in a short period time. They have little fear of humans, often coming up to peck at our boots. There were plentiful of young learning to swim in the shallows, moulting out of the fluffy grey fur or being weaned off being fed by the parents. The weaning process is called the ‘feed chase’, where the parent just runs away when the young comes to feed. The youngster usually takes up a grand chase through the colony until the parent eventually gives in or more commonly escapes into the ocean, forcing the young to fend for itself. All over the islands are strange white lines, sometimes several splaying out from one spot. It looks like someone has crazily marked the rock with chalk, but it’s actually squirt lines. The penguins lift their tails and squirt in a line up to half a metre in length. After a couple of hours Zodiacs delivered us back to the Plansius in time for dinner after which we settled in for more socializing and card games. …shining pink across the ice. Next, we’re off Along The Great White Peninsula. The weather of the last couple of days hasn’t been welcoming enough to hike and last night it was icy enough to sprinkle the mountains with a new set of snow. Today, it’s all blue skies, so together with an Australian couple and a trio of Israeli girls fresh out of their military service, I set off to see Esmaralda Lagoon. Once our minibus arrived, the six of us were on our way. But nothing here can be done without at least a little drama… As we exited the city, the minibus was pulled over at a police roadworthy station and because one of our headlamps was not functioning, we were turned back. The driver headed back into town, to a mechanic, where he bought a new bulb and we sat waiting as he replaced it. Then, 30 minutes later, we were off again. Laguna Esmaralda is on private land and the minibus dropped us at the owner’s place, Refugio Valle Los Lobos – a Siberian Husky breeder – where we paid 10 peso each – $1 Australian – to enter the area. The road was a little muddy, but the worst was yet to come… We passed a pair of beaver dams, although we didn’t see any beavers as they only come out late in the afternoon. We crossed an arroyo and though a forest before heading out across a peat field where most of our steps were soggy. Thankfully my leather hiking boots do a awesome job keeping out the water. On all sides as we crossed the field were snow capped mountains and a subarctic wind. The arroyo wound its way across the field and we found the least muddy and wet ground was alongside it where there were plentiful stones to stand on. As we breach the top of the cliff we see Laguna Esmaralda below us, tinged blue-green by the million year old minerals flowing down from the glacier. Across the lagoon, the Albino Glacier flowed down the side of the mountain and into the laguna. The six of us stopped for lunch, but it was a little chilly and after a while the cold began to get to the girls, so we headed back. There was only one guy there when we arrived and he seemed to be acting a little odd – he went for a run around the lagoon and when he got back stood dancing to himself with his headphones on. We joked that he must have eaten one of the mushrooms we’d seen growing in many places across the field. The return trail was easier to cross as we had a better idea where we were going but it still ended up being a slow process of watching every step. We made it back to the breeder’s place, passing perhaps three dozen other people heading to see the lake. We were glad we went when we did and as we pretty much had it all to ourselves – except for the one strange guy. Tomorrow I make my final preparations for my trip to Antarctica. Paso de la Oveja – Sheep Pass – is a two day hike starting to the east of Ushuaia and cutting a circuit around the Martial mountains, running 25kms along Valle de Andorra to end at the west side of the city. This is my first overnight hike in Patagonia and the only one I’ll be doing this far south. I was a little nervous about this hike as I brought my tent and sleeping bag from Australia. While they did the job on that continent, they’re not designed for the cold climate. Leading up to the hike, I investigated many of the adventure stores in Ushuaia’s Centro district looking for a means to add warmth to the sleeping bag without spending a thousand or more pesos buying a new one. I didn’t find anything so took the light fleece blanket from my bed in my hostel. To get to the beginning of the hike, I took a taxi from my hostel around the side of the Martial Mountains to a locked gate. While my spanish isn’t very good, I figured I’d show the driver the map and point out my destination. For some reason he got the idea I was wanting to be dropped off at the end!? I corrected him and he eventually delivered me to my start point. Past a locked gate I headed out along a dirt road towards the mountains with another glacier in view. My directions said to walk 5 minutes to a set of shacks and take a faint 4WD track to the right. I did and it led me into a set of peat fields where horses grazed. But after a while I discovered that the peat fields were rather soggy. By discovered I mean going knee deep into a bog. YAY! By the sounds of the description of the hike I was following, I wasn’t where I was supposed to be. So, I headed towards the mountains, picking my way through boggy grass. This took me some time but I eventually made it into forest. But this still didn’t feel right, and was also rather boggy with more knee high mud. I kept going towards the mountains and eventually found a not very faint but still rather muddy 4WD track. I followed it for a couple of kilometres through the forest with the occasional view of a mountain top. The 4WD track eventually petered out at a sign announcing my entry into Parque Nacional Tierra del Fuego. 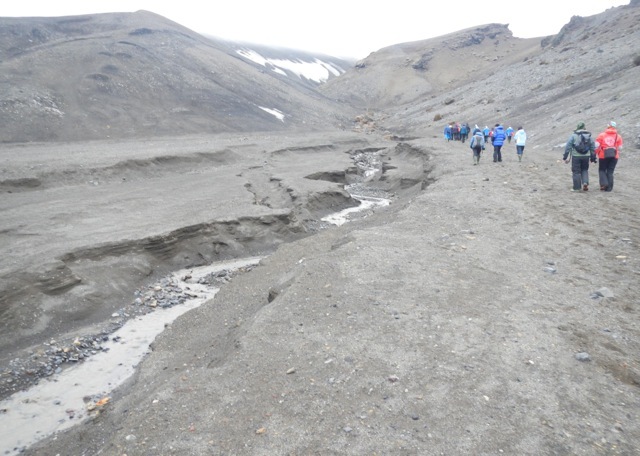 The trail crossed an arroyo – stream – that came down from the back of the Martial Glacier. At one point I came to an opening that led into a large red tinged field. This was off track, but as it gave good views of the mountains, I decided to head onto it. After only a step I discovered the field was in fact a growth of reddish green moss the size of a rugby field. It was spongy below my feet but supported my weight. I pushed on along the trail for another couple of kilometres through the forest, with the occasional show of towering rock above the trees. Late in the afternoon I arrived at a set of cascades in the river. Up until now Valle de Andorra had been flat, but according to my map the cascades marked the beginning of a 4km long climb. Nothing too high, just a constant climb. I crossed the arroyo several times on makeshift log bridges and wound my way up the side of the mountain. I broke the tree line and came to a T-junction and a sign. I headed right, towards the Laguna climbing along the top of a steep grassy bank with a fast flowing arroyo at the bottom. The trail was difficult and I made my way carefully to ensure I didn’t end up tumbling 50m to the stream. As I began along the track, I heard voices and a group of six other hikers appeared out of the forest behind. I hadn’t seen a single other person since starting, so they must have held just behind me all day. At a highpoint on the trail I got views back along the Valle de Andorra. To get down to it, I had to descend along a muddy bank and a rocky stream bed, watching each of my steps until I arrived at the bottom beside a waterfall. I walked along the arroyo that led to the lake and around a section of trees to locate a perfect campsite on the edge of the lake. There was already one set of hikers and the group of six arrived shortly after. Over the course of the next hour 3 other pairs arrived, but there was plenty of room and only the tents of the large group were close together. As the sun went down, I sat in my tent and looked out over the lake. The next morning, as I packed it rained a little, showering the lake surface with ripples. It didn’t last and I was soon off, back tracking along the path above the arroyo to the junction. After taking a break in the pass I pushed on. The trail headed down into Cañadon del la Oveja – Sheep Canyon – where the trail hugged the side of the mountain range hundreds of metres above a grassy area. While the thin trail at times felt precarious, careful progress was all that was needed along the 3km trail before it zig-zagged down the mountain and into the forest. Before I was surrounded in trees once more, I looked back along the Cañadon. The forest was supposed to be easy, but a portion of it looked to have been thrown about by a storm some time ago. This forced me to spend some time climbing over smashed trunks and broken limbs, a long and arduous task. I eventually got through and came out onto private property where I got a final look at a rocky mountain before heading down the hill towards and old motor racing track – autodromo. Overall the hike was amazing with brilliant views and special places. I didn’t end up needing the blanket, but better to have it than not. With only 6 days until I leave for Antarctica, there are a handful of other short hikes I’d like to do if the weather holds up. I’ll see which ones I can fit in.